Antibiotic resistance tests: Bacteria are streaked on dishes with white disks, each impregnated with a different antibiotic. 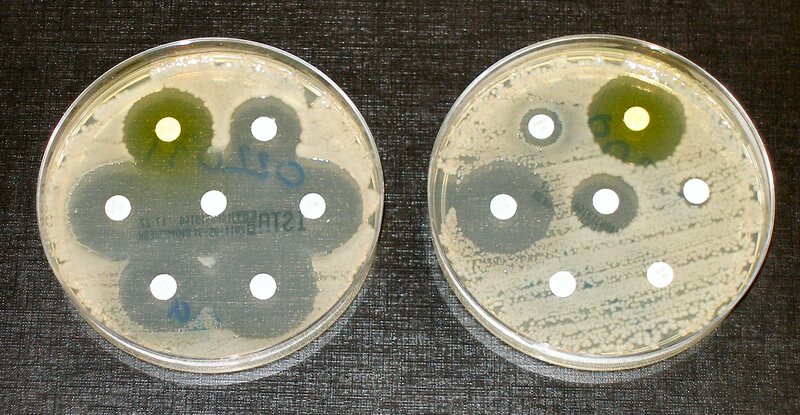 Clear rings, such as those on the left, show that bacteria have not grown—indicating that these bacteria are not resistant. The bacteria on the right are fully susceptible to only three of the seven antibiotics tested. For researchers, more contextual data from clinical trials means that we will be able to carry out meta-analyses to identify which contextual factor (e.g. poverty, complementary health policy) matters for the successful operation of a new intervention. That would then inform a design toolkit for clinicians that can guide them in identifying appropriate interventions, or advocating for changes in policy.